Happy New Year from Unforeseen Contingencies! I'm having a bit of trouble posting because of hardware problems (what the heck happened to my mouse?!) so will keep this short. The Unforeseen Contingencies Forecasting Department has a new batch of predictions ready to go, but I'll post them later. Briefly, though, P1. Next year at this time, Donald Trump will still be president, despite the best efforts of the Democrats to depose him. P2. The U.S. economy will continue economic growth at 3% or higher. P3. Proposals by the international "climate community" will meet increasingly stiff opposition at the national level around the world. They'll not be implemented. P5. U.S. carbon emissions will far and E.U. carbon emissions will rise. P6. The world space economy will grow faster than world per capita GDP growth, and both will be positive. P7. The Iranian regime will be racked by inner turmoil that that approaches civil war, but will not collapse. Its military adventures in Iraq, Syria, Yemen, and elsewhere will fail, though, as the Iranian Guard spends its efforts suppressing the Iranian people. P8. At least one Democrat in the U.S. Congress expresses sympathy for Marxism. And, of course, the Wild Card... extra terrestrial life will be discovered. More soon! Meanwhile, Happy New Year to all! Real Clear Energy has just published an op-ed by Unforeseen Contingencies intrepid chief blogger, Charles N. Steele. (I guess that makes me a professional journalist, heh!) I highly recommend it. Re the IPCC report, one of my students commented directly to me "I'm stunned by how explicitly it recommends 'transfer of wealth' to underveloped societies. How is this supposed to be accomplished? Amazing how a 'scientific study' assumes authority to assign responsibility (never to the backwards countries, of course)." Excellent point. If we want to understand why some countries are poor, we only have to examine the government of any or all of them - backwards indeed describes them, as well as corrupt. Taxing citizens of rich countries and giving to these governments is a terrible idea. The people at the Katowice climate conference who voted to accept this are either would-be recipients, or would-be tax collectors; they are not the taxpayers they hope to enslave. Aid to governments entrenches the power-hungry and the corrupt, and undercuts development. That the IPCC proposes this shows it is not a serious scientific organization. There's no attempt, not even a half-arsed one, to analyze the effects of these proposed policies. And there's no scientific economics behind it. It's a socialist political platform masquerading as environmental sustainability. Photo: a thing of beauty that makes humans better off. More on Kashoggi, the fake "journalist"
Perhaps most problematic for Khashoggi were his connections to an organization funded by Saudi Arabia’s regional nemesis, Qatar. Text messages between Khashoggi and an executive at Qatar Foundation International show that the executive, Maggie Mitchell Salem, at times shaped the columns he submitted to The Washington Post, proposing topics, drafting material and prodding him to take a harder line against the Saudi government. Khashoggi also appears to have relied on a researcher and translator affiliated with the organization. Saudi Arabia and especially the more liberal anti-Islamist factions including MBS, have been in a struggle against the Qataris. So have been the Emirates and other Arab governments. The Qataris, on the other hand, have been major supporters of Islamism and terrorist groups, including Hamas. Kashoggi was working for the Qataris in their struggle against the Saudis. Yes, he's a fine "guardian" for lefty progressives everywhere to adulate. Powerline has the complete story. The article contains links to further pieces of evidence that Kashoggi was not journalist but an intelligence agent and propagandist. Just a quick note to all, wishing you a Merry Christmas. 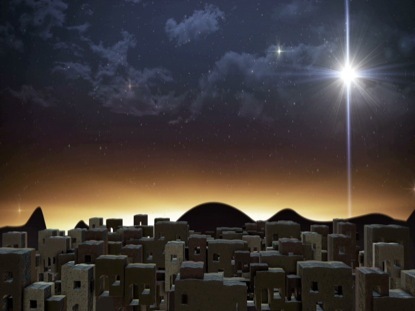 It's a time of celebration and renewal of life, and believers and non-believers should celebrate. Dennis Prager explains. Note that Prager is not a Christian but Jewish, and both religious and kind-spirited. He's also wise. Evidence for our Wild Card prediction is ... not forthcoming. Attempts to detect communications from Oumuamua have turned up nothing. The object's unusual acceleration and movements have scientists conjecturing that it's a vehicle of some sort, but testing this hypothesis has proved difficult, and it's a little late now because the darned thing is getting away. If it could be shown that Oumuamua was sending signals of some sort to whomever or whatever sent it it would be evidence of the existence of whomever or whatever. Unfortunately, nothing has been detected. 1. We ought to have a probe ready for the next time this happens. Apparently it is within our technological capability to investigate an object that comes as close as Oumuamua, but we'd have to be prepared. There was very little time from the moment Oumuamua was first detected. 2. That "very little time" ought to concern us, because a large object could be hurtling towards us on a collision course right now. Oumuamua shows that such an object can get very close without us noticing -- too close for us to have time to react. If we want to avoid Lucifer's Hammer and expect to do anything about it, we ought to begin preparing now. Regardless, no one can figure out what the heck this thing is. It's highly unlikely humans will ever know. "We" at Unforeseen Contingencies are libertarians, which means we think individual liberty is the highest political value. Thus we are pleased when we see the leader of a country move to increase individual liberty in his country. For that reason we support Crown Prince Mohammed bin Salman of Saudi Arabia. He is a liberalizer, in the true sense of the word. I first caught wind of this when a friend, a Muslim who often travels to Saudi Arabia, told me how astonished he was at the changes he'd observed since MBS had taken the position. My friend called it radical westernization and modernization. He detailed some of the efforts -- things that have gone unreported in the Western MSM -- and correctly predicted that women would be able to drive soon. MBS has also cracked down on corruption, on the Muslim Brotherhood, on radical Wahhabism, and Shia/Iranian expansionism. It's crucial that this project succeed, for Saudi Arabia is the center for Islam. If Islam is to become compatible with liberal civilization, Saudi Arabia must reform, and that's the project of MBS. In the West, allies of the Muslim Brotherhood and the Iranian regime -- particularly those allies in the mainstream media -- are up in (figurative) arms, so much so that they've taken sides with the Islamist dictator of Turkey, Recep Erdogan, over the death of Jamal Khashoggi and even taken to calling the deceased op-ed writer a "journalist." (I've written op-eds, so now I'm a "journalist?" Wow!) The MSM has also condemned Saudi Arabia's perfectly legitimate intervention against the Houthis in Yemen. This is a war by Yemen and Saudi Arabia against one of Iran's proxies and by extension against the Iranian Revolutionary Guards Corps. Yes, nothing like the MSM defending colonialist wars by Iranian Islamists who declare their intent to destroy the United States and Israel, and condemning their opponents. 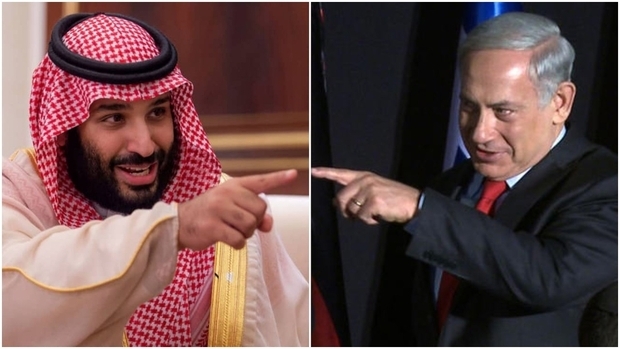 Mohammed bin Salman is the first Arab leader to say Israelis have a right to have their own land. Mohammed bin Salman is the Arab leader most insistent that the Palestinians must start negotiating and give up their dream of expelling the Jews. Mohammed bin Salman is modernizing and westernizing Saudi Arabia, he's building an alliance with Israel, he's opposing Iranian expansionism... he is, in the Saudi Arabian context, a liberal. In a grand show of virtue posturing, the U.S. Senate stupidly voted to condemn him. But he and his reform efforts deserve our support. I hope President Trump will ignore the Senate's posturing and continue to build U.S.-Saudi relations. Photo: Mohammed bin Salman and another great Middle Eastern leader. Predictions for 2018: Wild Card Hit? We're close. 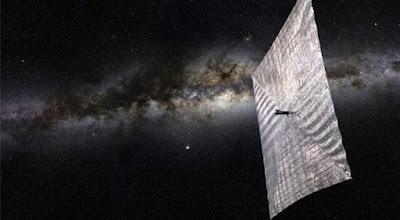 At least, researchers can't think of an explanation for Oumuamua other than an alien light sail craft. It would surely be exciting to further study this object that has traveled from outside our solar system, but unfortunately it is getting away. This poses a real dilemma. How are we at Unforeseen Contingencies to decide whether our prediction that extra-terrestrial life would be discovered is right or not? 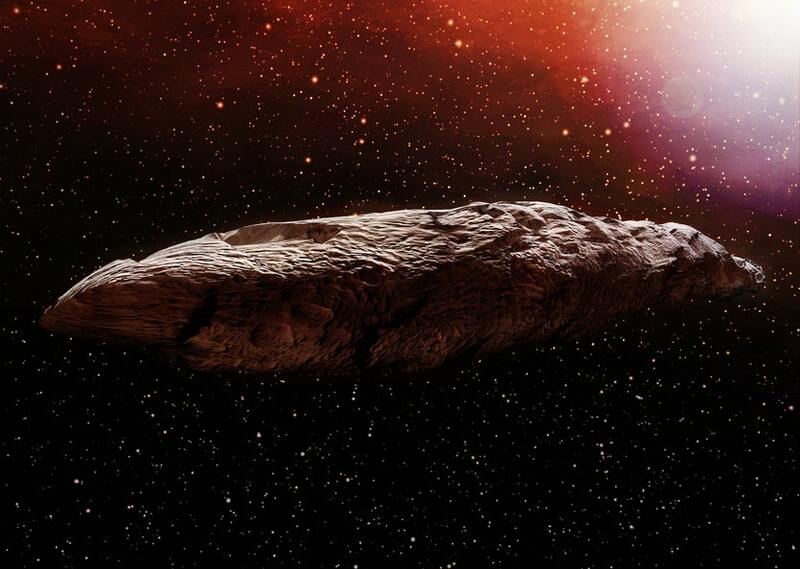 One conjecture is that Oumuamua is "space junk," a lost or abandoned spacecraft. If so it's evidence of a heretofore ignored negative externality -- alien garbage. Environmentalists need to get on top of this. A first step would be a Pigovian space garbage tax. I'm sure EPA regulations and German Grünpunkt laws should follow. No doubt IPCC will need to get involved; while there's no particular relation to climate change, that hasn't stopped them before so why should it now? All of this is authorized, of course, by the 1967 Outer Space Treaty, which establishes that all of outer space is the common property of all mankind. Exactly who will collect the new space garbage tax, and from whom? Those are details to worked out later...just like all the rest of the monitoring and enforcement of the Outer Space Treaty. But another conjecture is that Oumuamua is a reconnaissance craft. If so, its rather rapid pass-by suggests a report of "found nothing of interest, no civilizations, just some undeveloped life forms on the third planet, continuing on" which is rather humiliating to contemplate. Regardless, if either of these could be established, it's a "hit" for us. The Unforeseen Contingencies Space Desk continues to monitor the situation. We'll revisit when we do our annual predictions tally. Greetings readers, real or imagined! Blogging has been sparse, owing to a heavy workload. As we are almost to the end of the semester, "we" at Unforeseen Contingencies plan to pick up the pace a bit soon. Meanwhile, here's a brief summary of some of what has kept me busy. 1. IPCC's recent Special Report SR 15 has next to nothing to do with climate change, and everything to do with promoting a world government that centrally plans a global economy. Among other things, it calls for national governments to take over allocation of finance. It also calls for the elimination of fossil fuels and wealth redistribution from wealthy (i.e. productive) countries to poor (i.e. unproductive) countries. It's utter nonsense and should be rejected. I'll explain in an upcoming post. 2. Space economics -- I've been reading like crazy in this field. Space development is likely to revolutionize our economies. It's *far* more urgent than climate change. How we do it will matter greatly. I'll blog on this soon. 3. Paul Ehrlich's The Population Bomb is now 50 years old. I've been working on a careful analysis of his predictions; he's so wildly wrong that the neo-Malthusian worldview is entirely refuted. The few predictions he gets right are the ones where problems are caused by absence of private property rights...and none of them are the life-or-death problems he makes them out to be. I'll probably comment on these in the future, and certainly will have some Christmas and end-of-the-year posts. Meanwhile, I've updated the Unforeseen Contingencies blogroll to include Victory Girls and The Stream. Victory Girls is run by a passel of libertarian-leaning conservative women. They tend to be pretty feisty. It's good. The Stream is a conservative blog usually written from a Christian standpoint; again, usually libertarian-leaning. It can be interesting. Meanwhile, nominally libertarian sources (Reason, and even Cato) seem to be plunging headlong into post-modernism, allowing the post-modernist left to frame the terms of debate. I suppose I'll have to blog about that, too.